BACKGROUND: Hoary cress (also known as whitetop) was introduced to the U.S. from Europe in the late 19th century. It was first noted around seaports on the east and west coasts, indicating seed may have been in the soil that was used as ballast for sailing ships. Hoary cress spreads both by seed and creeping roots, living in a wide variety of environmental conditions. DESCRIPTION: Hoary cress is a perennial that grows up to 3 feet tall. Leaves are grayish green, clasping, lightly pubescent, up to 4 inches long, and are shaped like arrowheads. Flowers are white with 4 petals, 1/4-inch across, and bloom in April and May; these dense flower clusters give the weed a flat-topped appearance early in the season, but this is lost as the stem elongates. Two small, flat, reddish brown seeds are contained in each of the heart-shaped seed pods. 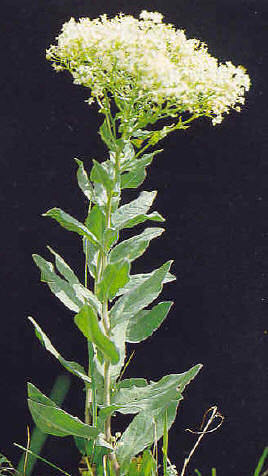 DISTRIBUTION: Hoary cress is found throughout the U.S. except from southernmost California across to the southernmost Mississippi, and is extensive in Idaho. CONTROL: Some herbicides are registered for and effective on hoary cress. There are no biological control agents for this weed.